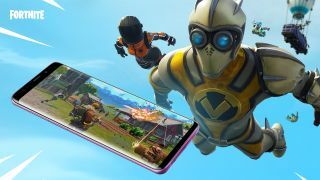 Back in August, Epic Games spread the Fortnite phenomenon to Android mobile devices by way of the Fortnite Android beta. It started with Samsung Galaxy phones (there was even a unique skin if you bought a new Galaxy to play it on), but soon the beta spread to a wealth of other devices. There was just one hurdle to widespread on-the-go Fortnite enjoyment: you needed an invite. But starting today, that is no longer the case. The Fortnite Android beta is now open to everyone with a compatible Android device. Not seeing your device on the list? The beta may still work as long as you have a 64-bit Android 8.0 or higher operating system, 3GB or more of RAM, and a GPU equivalent to or better than an Adreno 530, Mali-G71 MP20, or Mali-G72 MP12. Don't rush off to the Google Play store just yet, though. Instead of going through the Android digital storefront, you'll want to mosey on over to fortnite.com/android. There you'll be able to download the beta straight from your browser. You'll need to go through a few authentication steps, but otherwise it's pretty much just like installing any other app. And once you've got it installed, you can sync your account so you keep the progress you've made on other platforms. Other than the graphics, this is still the same game you can play on console and PC - that means our Fortnite Battle Pass Challenges guide and Fortnite Tier 100 Challenges guide will still give you all the info you need in order to earn those sweet, sweet skins.